Learn how social workers use their professional expertise to assist people. 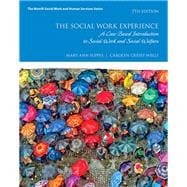 The Social Work Experience: An Introduction to Social Work and Social Welfare introduces students to the social work profession and presents detailed descriptions of eight major fields of practice. The text provides in-depth information concerning major social welfare policies that are are presented in historical perspective, along with thorough discussion of current issues and probable future trends. Major case studies assist students in understanding how professional expertise can advance social-work practice and how enlightened social policies must be present if professional interventions are to be effective. The first four chapters of the text introduce the social work profession, present theoretical perspectives on which professional practice is based, explore how the intersectionality of multiple factors impacts social justice issues, and then describe social policy issues in historical context. The following eight chapters describe eight major fields of practice along with the history of each one. A thorough and detailed case study begins each chapter, helping to illustrate social work practice in the respective field, and every chapter includes additional case studies to help students better understand the challenges involved in social work practice. The final chapter of the text explores the many probable challenges awaiting contemporary social workers given the social forces impacting society. By combining trusted author content with digital tools and a flexible platform, MyLab™ personalizes the learning experience and improves results for each student. MyLab Helping Professions organizes all assignments around the CSWE EPAS for Social Work and CSHSE Standards for Human Services—enabling easy course alignment and reporting. Note: You are purchasing a standalone product; MyLab does not come packaged with this content. Students, if interested in purchasing this title with MyLab , ask your instructor to confirm the correct package ISBN and Course ID. Instructors, contact your Pearson representative for more information. Mary Ann Suppes is a professor at Mount Mary University where she taught and chaired the Social Work Department for many years. She currently teaches two courses per semester at Mount Mary and remains involved with committees. In addition to previous editions of The Social Work Experience, she has published several periodical articles. She is a member of the Baccalaureate Social Work Program Directors Association (where she has served on the board of directors), The Council on Social Work Education (served on committees), the Wisconsin Council on Social Work Education (served on their board for many years), and the National Association of Social Workers and the Academy of Certified Social Workers, and is a licensed clinical social worker. She has conducted numerous accreditation site visits for Council on Social Work Education accreditation, and has served several terms on the CSWE Commission on Accreditation. Her social work practice experience has been in the fields of health care, especially pediatrics and obstetrics, and mental health. She provides curriculum consultation for schools of social work. She received both her undergraduate and graduate degrees in social work from the University of Wisconsin Milwaukee. Carolyn Cressy Wells is professor emeritus at the University of Wisconsin, Oshkosh. She was the social work program director at Marquette University for many years. She is a member of the National Association of Social Workers and the Academy of Certified Social Workers, and is a licensed clinical social worker. She has served many times as an accreditation site visitor for the Council on Social Work Education, and has authored three other texts: Social Work Day to Day: The Experience of Generalist Social Work Practice; Social Work Ethics Day to Day, Guidelines for Professional Practice; and Stepping to the Dance: The Training of a Family Therapist. She maintained a small private practice in family counseling for many years. She is a certified music practitioner and currently plays celtic harp at local nursing homes. She received her undergraduate degree in Anthropology from the University of California at Berkeley and an MSSW and PhD in Child Development and Family Relationships from the University of Wisconsin, Madison.